So after two weeks of vacation eating, it was time for a reality check. One cannot survive on spaghetti alla olio, spinach, and red wine forever. One’s intestines will start to rebel. A. left yesterday afternoon but there was no point in cooking last night. No, last night was reserved for wallowing and watching ‘Father of the Bride’ while finishing off the last of the Italian wine. Back on track today though. I dragged Fialonia out of bed at 8am and we made the trek to Herb & Spice. I’ve been craving Mexican for awhile but as avocados take time, I purchased one today and will have to wait until Monday for my Mexican recipe (a tortilla pie…I’m intrigued). For lunch today, I wanted something easy (unsurprisingly, I have an unbelievable amount of work to catch up on and just found out that I’ve been invited to present my thesis work at a conference in two weeks…hahaha. This should be more than a little interesting). Soup is the easiest thing in the world so I went with a recipe from La Dolce Vegan called ‘On Golden Pond Mushroom Soup’. With some adjustments, this recipe was delightful. Chop up your celery, mushrooms, onions and garlic and throw in a soup pot with the oil. Saute on medium heat until onions are translucent. Add the spices and tamari sauce and stir constantly for about 3 minutes to avoid sticking. Add the flour and mix until a mushroom-y paste is created. Slowly add vegetable stock (my version of ‘slowly’ is to add it all…that was stupid as things did not blend the way that they were supposed to. Patience, Grasshopper). Bring to boil and then turn down heat to simmer. Add the soymilk and let simmer for about 8 minutes. Serve. 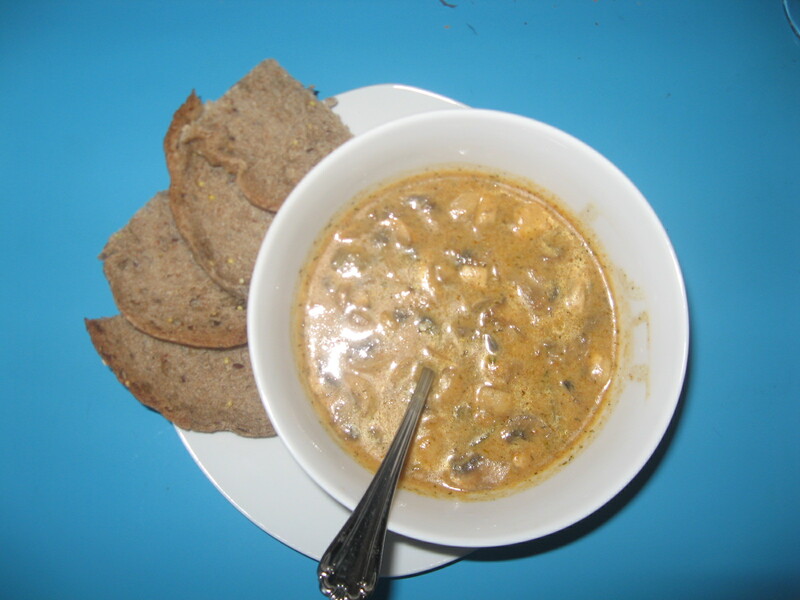 I had some lovely, bakery-fresh whole wheat bread with this soup and munched on a cup of celery while I was making it to get some greens in there. I can imagine, though, that this soup would have tasted fantastic with a side of steamed kale or collard greens. Just a thought. ← >A. is in the house. For reals. >”just found out that I’ve been invited to present my thesis work at a conference in two weeks”AWESOME!!! !